While poking around WordPress a few weeks ago I stumbled upon the “Weekly Photo Challenge,” and it peaked my interest. Then, all of a sudden, a few of the bloggers I follow started doing Weekly Photo Challenge posts, and I took it as a sign. I cannot promise that I will do them every week, but I am going to try. I miss writing, and need some inspiration. These posts may be off topic, but I hope you enjoy. Mountains are my favorite horizon. These are my mountains, the ones I can see from my front porch, as I drive up the road to my home, the ones I get peeks of from my backyard. 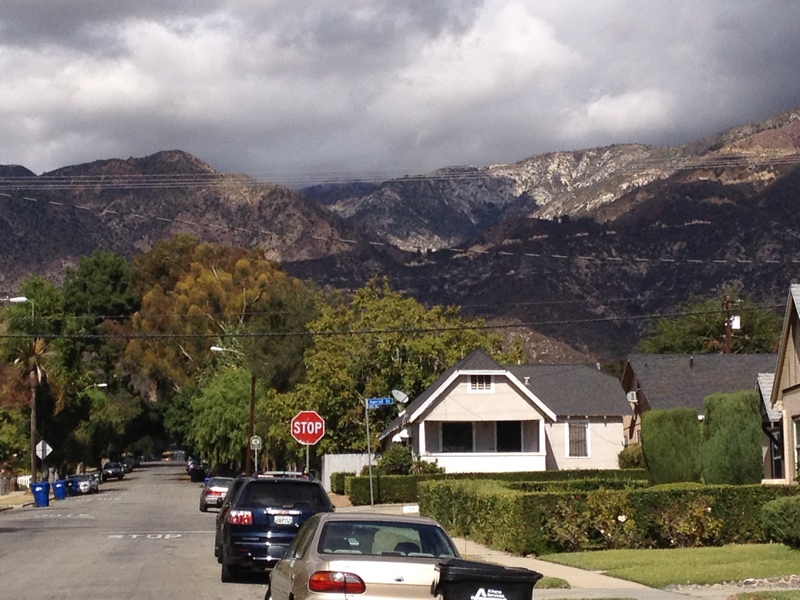 They are the backdrop of Altadena. At first glance these mountains, the front range of the San Gabriels, seem sort of mundane. Not the rugged ridges, deeply forested, snow-capped peaks of the Cascades or the Olympics. Those are the mountains I fell in love with first. I grew up with these mountains in the distance, but never really saw them. Now, having lived at their feet for the past seven years, I have come to love these mountains just as I love those other mountains. These are subtle (most of the time). They change from their normal brown to the briefest of green in the spring. A couple of times a year the very tops are dusted white only for it to disappear by lunch time. The clouds like to gather and cling to the tops, creating subtle, but transformative changes to how the light falls on its rounded ridges and valleys. And then there are times when they can be more dramatic. I watched a ravaging fire rage across the very closest of slopes pushing neighbors and friends out of their homes. Their geography can create winds so strong trees snap in half and tens of thousands of people are left without power for days. Every so often the fog that encases them breaks up just as it does on the majestic Andes surrounding Machu Picchu, creating a mystical wonderland of a landscape. These mountains allow my children to look for frogs in its streams and smell the sage along its trails. These mountains provide a quick escape from city life. These mountains stand tall, strong, and beautiful. These mountains fill me up. A beautiful post – I love mountains too, I think that’s why I end up (as much as time and money allows) in the French Alps so often – something about a big landscape and the possibilities it presents. And how magical that mountains are places for streams and kids looking for frogs – that is simply magical in my mind. Yes! Yes! Yes! To everything you said. I read your Weekly Photo Challenge post, “Green,” and that was the tipping point for me. Green is my favorite color, by the way. Always has been. I too like the idea of writing about me in other ways. I look forward to reading your posts as well! Beautiful! I live along the foothills in Colorado and I think they are second only to the ocean for best place to set up home! The ocean is a magnificent horizon too. Maybe if I lived on the beach I would say it was my favorite. But, for now the mountains are it for me. I can only imagine the foothills of the Rockies to be nothing but amazing.